Eleanor Wilson McAdoo writes Jessie Wilson Sayre to congratulate her on the birth of her daughter, Eleanor Axson Sayre. I am so, so happy for you, beloved sister mine. It is too sweet—a little girl—just what I wanted you to have and what I knew you wanted. Oh, if I could see her and you and tell you a little of my love and happiness for you—I was so excited when Helen's cable came that I could hardly sit still a minute—and so surprised! Because I was waiting for April to come to begin expecting such news. She must have surprised you, didn't she? I am simply wild to hear more—to hear something besides just the mere fact that she has arrived and that you are both well, thank goodness! And I won't hear for ages—heaven knows when. Oh darling, it is hard to be away off here right now when I long with all my soul to be near you and to see you and your precious little angel. If I could only tell you how I love you and how beautiful I think it is. I hope with all my heart that you didn't have too dreadful a time. It is always bad, but I am wishing very hard that it was, at least, no harder than last time. And what is she like—and what did she weigh and are you really going to name her Eleanor Axson (I am sure Frank wants a Jessie Woodrow) and were you safely at the hospital when it happened??? Oh, how can I wait to hear all these things! I feel as if I were dropping questions into space and would never get any answer. Isn't it lovely that our little girls are so close together—only ten months. They will be like real sisters and will adore each other—it makes me so happy thinking about it. And Frankie will boss them around and be worshipped by them both. 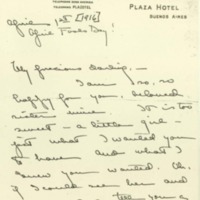 McAdoo, Eleanor Wilson, 1889-1967, “Eleanor Randolph Wilson McAdoo to Jessie Woodrow Wilson Sayre,” 1916 April 1, WWP17531, Jessie Wilson Sayre Correspondence, Woodrow Wilson Presidential Library & Museum, Staunton, Virginia.